Cincinnati Art classes for kids, older students, parents! Searching for the best art classes in Cincinnat? 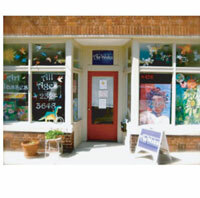 We offer art classes for preschool, elementary, high school, and older students. Our Cincinnati art classes are offered afterschool, evenings, and weekends with ongoing registration. We specialize in art lessons, drawing lessons, painting classes, painting lessons, perspective training, and mastery of color in our Anderson Township studio near Mt. Washington on the East side of Cincinnati, Ohio. Using a step-by-step method, students of all ages are taught basic drawing and painting skills which result in art work that is both realistic, attractive, and worth of showing. Our art students experience the excitement and fullfillment of creating art as they are taught on an individualized basis according to their personal skills and abilities. Each student moves ahead at his or her own pace. This enables our students to attain the artistic "tools" they need to create art for the rest of their lives. Our goal is to make art lessons accessible and affordable and we believe that a strong foundation of real hands-on skills will enable students to eventually follow any artistic path they choose. The student explores drawing and painting mediums such as charcoal, graphite, pen and ink, pencil, pastels, watercolors, acrylics, and oils in a creative and fun environment. These are real art lessons. We teach drawing and painting skills: perspective, composition, value, line, form, color, and style.